April 23rd is National Administrative Professionals’ Day and to honour this Staples holds an annual survey of non-admin and admin workers. For the second year in a row the survey found that the admin boosts employee morale and is a better team player than the boss. The online poll also found that admins do everything from accounting to human resources. They have often managed their boss’ social media accounts, provided childcare, watched their pets and even provided fashion advice to their superiors. When it comes to who holds the most power in the office, the boss wins. But second in command is the admin, ahead of the chief financial officer and human resources director. And once again, the majority of survey participants report the admin is working harder than ever and supporting more people than the previous year. To celebrate National Administrative Professionals’ Day, Staples offers an assortment of great gift ideas for your admin, with free shipping for Staples Rewards Members and next day delivery in most cases. Gift ideas include a desk makeover, a single cup coffee brewer, a new office chair and new notebooks and pens. The possibilities are endless at Staples! 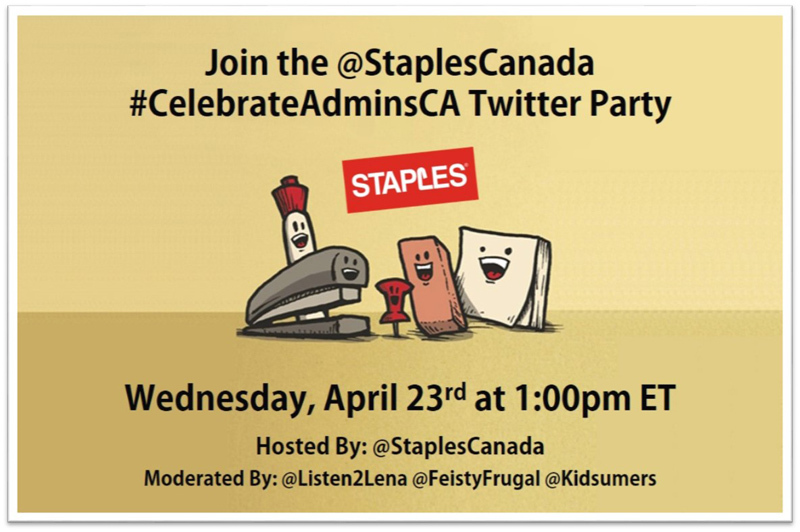 In honor of National Administrative Professionals’ Day, Staples Canada is hosting a Twitter Party! RSVP with your twitter handle (eg. @kidsumers) below. You must RSVP to be eligible to win. They totally deserve a dedicated day! The Twitter party sounds fun! Oh this is going to be a blast! Thank you so very much. Hi Melissa, You need to RSVP in the linky above. Thanks. I’ll try to be there, sounds fun! I couldn’t live without my Admin Professional! She is amazing! I will be working but I will try to come to show my support! I’ll be there with my party pants on!! Got it on the calendar. Can’t wait to chat.